PC Building Fundamentals aims to provide you with a solid foundation of knowledge in order to help you select the components for—and build—a new Personal Computer. As custom-built PCs have become more mainstream, the amount of users opting to build their own rather than purchase pre-built systems is steadily increasing. Whether you have just started to consider the idea of building your own PC or you have been doing it for quite some time, hopefully this series will be beneficial to you. Each individual episode covers a specific topic that will be tackled as objectively as possible, while striving to use a range of sources and factual references rather than just a singular opinion. It is worth noting that building a PC is not for everyone; assembling a computer is very much ‘at your own risk’. Whilst the individual parts will usually be covered by warranties, there is an inherent risk with putting something together yourself. With that said, the satisfaction from putting together your own PC and having it work as intended vastly outweighs the convenience of purchasing a pre-built system. 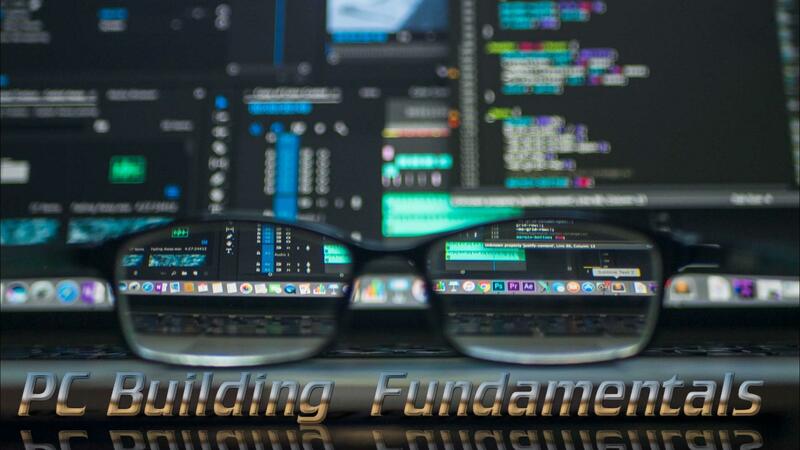 PC Building Fundamentals aims to provide you with the confidence to tackle your own custom build, as well as some tips and tricks along the way. The series will utilise a combination of my own knowledge, trusted references within the tech community, visual demonstrations, and virtual demonstrations using PC Building Simulator. When Does a Pre-built PC Make Sense? Customer Support – not all companies are equally good at this I will admit, but take the folks at Origin for example: 24/7 and 365 days a year customer support. Building your own PC is one thing, but what about after the fact? It should work – as long as you purchase from a reputable brand, all of the components should play nicely with each other. A novice builder however, can sometimes mismatch parts and be left with an expensive paperweight. Customisation – many boutique vendors also offer services such as airbrushing or custom liquid cooling, aspects of PC building that may be a step too far for the novice builder. But if you have the cash, you can potentially purchase a ‘one of a kind’ custom PC. A prologue is defined as “an opening to a story that establishes the context and gives background details”. You might think that this is unnecessary, but before we dive right into the subject at hand, I feel that we need to discuss what this series is and what it is not. This prologue gives you an idea of what to expect from future episodes, as well as providing you with a brief outline of what this series will cover. For this particular episode I climbed out of my ‘gaming cupboard’ and recorded from my living room, just for a casual chat. The downside is that the audio quality is not what it would usually be, so apologies. The majority of future episodes will be recording using a proper microphone. If you want to further discuss the topics as the series progresses, you can get involved in the conversation via either the Scholarly Gamers’ Discord Server or over on our subreddit; where every article and video from the site is posted. I hope you enjoy watching this series, as I know I will enjoy recording it. JungleDrums: Ep 41 – Is Destiny 2 Beyond Saving?